Cuellar Elementary Principal Melissa Shinn's campus is a beneficiary of literacy programs. On the first day of Fall classes at Texas A&M International University (TAMIU), Congressman Henry Cuellar, '82 (D-TX-28) and representatives from TAMIU, the One Star Foundation, the Lamar Bruni Vergara Charitable Trust, the League of United Latin American Citizens (LULAC) and Laredo First Assembly of God announced the awarding of $2.4 million in federal grants, and two matching donations totaling over $184,000 to TAMIU to provide incentives and opportunities to help university students who are migrant workers or seasonal farmworkers overcome the obstacles and difficulties of a migrant work schedule. Of the $2.4 million, $2,124,950 will come from the U.S. Department of Education (DOE) – College Assistance Migrant Program (CAMP), which will be allocated over five years to TAMIU, and $317,564 will come from the Corporation for National Community Service (CNCS). These funds come through the One Star Foundation, which is the administrator for the Federal AmeriCorps program. The Lamar Bruni Vergara Charitable Trust, a longtime University supporter and generous champion of literacy programs in Laredo, will also donate $180,897, and LULAC and the Laredo First Assembly of God donated $3,250, bringing the total combined investment to $2.6 million. With these funds, TAMIU will provide extended student support services, award students with scholarships towards educational expenses, hire appropriate staff and mentors to support the university students during their education, as well as 72 AmeriCorps members who will serve economically-disadvantaged students in local elementary schools through one-on-one literacy tutoring services. Dr. Pablo Arenaz , interim president of TAMIU, concurred. “We are deeply appreciative of Cong. Cuellar and our multiple partners who have joined forces for these initiatives, all of which share a vision of a better future for our students and community,”. “It is through such strong alliances that we are able to best deliver on our mission of higher education for all students for Laredo and our region," Dr. Arenaz said. Dr. Julio F. Madrigal, professor and executive director of TAMIU's Office of Special Programs which oversees the CAMP Program, said the grant breaks barriers. “We know that Cong. Cuellar can personally attest to the will and drive of students who benefit from our CAMP program. We know that with this generous support, we will continue to dismantle real or perceived barriers to higher education for migrant or seasonal farmworkers," Dr. Madrigal explained. Dr. Philip S. Roberson, AmeriCorps coordinator, and College of Education associate professional. said the AmeriCorps grant makes measurable impact on young Laredoans. “We’re excited that this broad support will help us to powerfully extend our direct literacy tutoring services to local low-income elementary school students. These efforts have measurable impacts on student learning outcomes and help pave the way for school success and brighter futures. These additional AmeriCorps tutors add to similar services already in place in six Laredo elementary schools years serving hundreds of students annually. The Lamar Bruni Vergara Charitable Trust has supported the existing Literacy Enrichment Centers (LECs) over the past two years with generous funding of more than $630,000. Additionally, LULAC Chapter 7 has contributed $5,000 to support LECs in two LISD schools in the past year. Adding to these funded literacy programs, this AmeriCorps award truly extends services to many more Laredo children, ” Dr. Roberson noted. 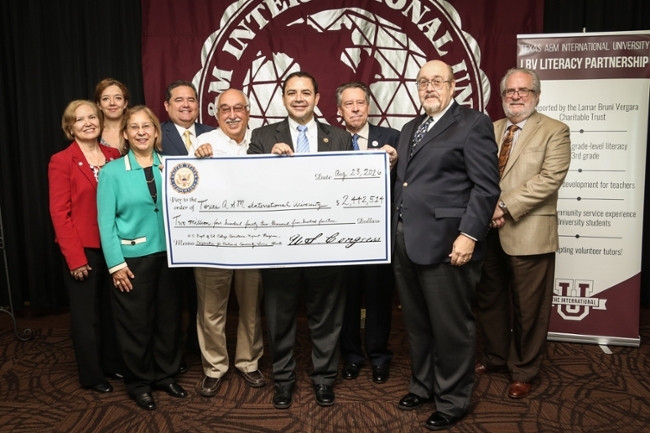 Congressman Henry Cuellar (D-TX-28) and representatives from TAMIU, the One Star Foundation, the Lamar Bruni Vergara Trust, LULAC and Laredo First Assembly of God announced Tuesday the awarding of $2.4 million in federal grants, and two additional donations totaling over $184,000 to TAMIU to provide incentives and opportunities to help University students who are migrant workers or seasonal farmworkers overcome the obstacles and difficulties of a migrant work schedule.